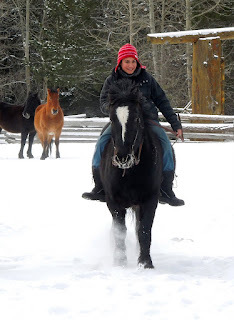 A wintery experience for our English as second language students.. and horses! The winter months are not the busiest for the English as second language school. Our language students are enjoying all the activities they can in the snow. It is also a quiet time for our mountain Cayuse horses and they can relax in the sun. Our language students are learning a different vocabulary than they would in the summer. Student v teacher snowball fights are common these days. English as second language students go Ice fishing as part of their winter activity program. Most of these students from Europe have never even been fishing let alone Ice fishing. Everyone had a lot of fun drilling holes in the ice then dropping their lines into the water below. It was also a good opportunity to practice their language training and fluency by practicing the new vocabulary that they have learnt. Several of them even managed to catch a fish! It may be winter and we may have snow on the ground but it is still fun for our students to go riding. The horses really seem to enjoy being out in the snow as much as our students do. 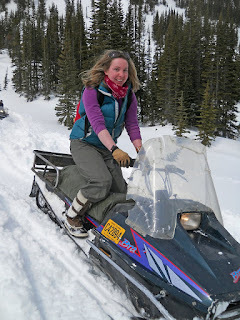 Although we can not go up into the mountains, there are still plenty of trails around the ranch to have fun on. January is a slow month for English as second language students at our school. Most students are looking for summer riding up in the mountains but winter also has its special attractions. Classes are usually held informally around a log fire in the school with Hot chocolate and muffins for snacks. This makes for an even more relaxed atmosphere and when the students are relaxed they always tend to speak more freely which in turn helps to improve their fluency.